Yeah, I heard they were known as Barcelona because of the way they play. They were also playing against an American youth team called Arsenal, weren't they? Yes and if you read the article, they got beat in the round of 16 in that California tourney! I tried to find a youtube of the team that beat them but couldn't. Must have been very talented too. I think the intention of that academy is great, you have to start somewhere, and total football is a good system to develop players in. But that youth team looks better than it is because the opposition is crap. The under 10 team(California state champions) of that Barcelona USA academy played against the under 10 team of the actual FC Barcelona 2 months ago, and lost 8-0. Just to put it into perspective. They probably just hit the woodwork three times, passed and not shoot!!!! jk. I like what Liverpool is trying to do. I think it's pretty vital to breed kids as young as 10 to the style of play the club wants to be playing. Have them step up into the next groups as they get older and this makes sure the group of players play together often and understand how they are supposed to be playing. By the time they reach the first team if they are good enough, we'd actually see the rewards. It probably took Barcelona like what? 20-25 years to see the results? I mean, they did win trophies in between as well but the last four years, they practically dominated football. Javier Mascherano has been sentenced to one year in jail for tax evasion, Barcelona are expected to pay a fine which should keep him out of the brown stuff. Send him down, just because he's a multimillionaire footballer does not mean he's above the law. Hard but if it was Josė Bloggs, he'd be eating paella, they serve it 3 times a day in the Spanish prisons. , he'd be eating paella, they serve it 3 times a day in the Spanish prisons. thought you where talking about Lfcacrossthewater for a moment. Last night i was in heaven when i saw the ugly tw*t's face when Barca were 7-0 up. Bashing managers on Sky isn't the same with actually doing the job, what a clown. The c**t probably thought that it would be an easy ticket the the old toilet job. I genuinely don't think he'll be able to return straight away, he's going to need a while to get over the embarrasment of getting his arse kicked every week. I never used to go out of my way to watch a team but I do for this specific Barca team. I'm not a fan of them or anything but like you say, when that front 3 clicks it's unreal. You know you're going to get entertained and see goals. It has been career suicide really. They are a club on the slide. Questions now over his role in the England set up too. Wonder if Rafa will be tempted to go back to Valencia? 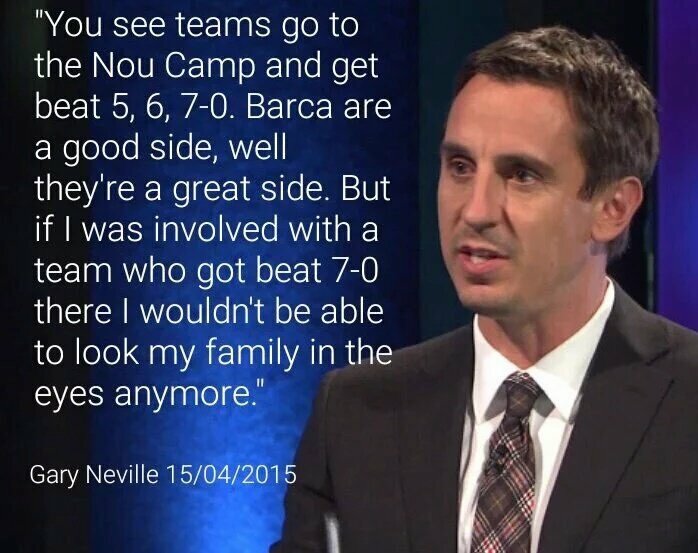 How does a billionaire business man deem Gary Neville worthy of the managerial position at Valencia when he has zero experience and all he's ever done is talk on TV? I sometimes question how these guys made their money if that's how they run a business. To be fair, they probably looked at the success throughout his playing career, hoped he picked a thing or two up from Fergie and the fact that he does seem to know what he is talking about. Makes a bit of sense but yeah, I can't understand it either at a club like Valencia. I can't stand the front 3 of Barcelona. How can that be good for football? Money and winning and that is it. I even read these days how hard working these superstars are. I mean for 10 million a year .. they actually keep in shape!! In the old days we used to talk about a player being international class,they should now call it Barcelona class,because if they played England in a match we would get slaughtered,and tbh there is not a team in international football who would beat them. Messi and Suarez need to stop letting Neymar take a penalty if they get one and he is the only one out the 3 without a goal in the game because he is constantly missing them. He's like Owen was, could score goals with ease but just generally sh*te when it comes to penalties. Lim who owns Valencia has shares in Salford United, rat boy's club.... Join the dots mate. I know all that but even still, he didn't appoint Phil Neville who was already at the club so I don't see why he would appoint Gary. It made no sense whatsoever. but its fun to watch isn't it. the same businessman who let Jorge Mendes park his clients at the club with the aim of getting money for them when other clubs come calling. I dunno, I like it. Why not bleach the beard too !